Home Uncategorized Eating Late…Does it Matter? If I eat late, do I gain weight? That myth is ridiculous and has been around for a while, and although some people could swear that their late-night eating habits do make them gain weight, recent research has shown that your body doesn’t process food differently at different times of the day. Think of it this way…A slice of bread on the label is about 100 calories/slice. Does it say if you eat it at 7am versus 11pm the calorie content will change? Does it say if you eat at 11pm the bread is now 150 calories? The total amount of calories that you take in, and how much you exercise during the day, are what affect your weight. One aspect of weight management that is vital to understand is that we gain and lose weight over periods of time — weeks, months, years — not hour by hour. This happens as we take in more calories than we expend. Another important fact of metabolism is that our bodies do not stop working, even when we are sleeping! Hearts are beating, blood is circulating, lungs are functioning, brains are even working. This all takes energy — meaning we are still burning calories. Here is the catch! Many people do tend to overeat and choose high-calorie foods as snacks at night, both of which will cause weight gain. So why do we select those type of foods at night? One reason is we like the taste of foods with a combination of fat, sugar and salt. After foods such as cookies, pasta, burgers, chocolates etc. hit our taste buds, dopamine and norepinephrine are released. Those neurotransmitters cause us to feel happy and satisfied. Does the refrigerator call your name after dark? Chances are, you satisfied your hunger at dinner, so these late-night munchies are not about being hungry. Instead, they’re a result of habit, boredom, stress, or fatigue after a long, hard day. No matter what the cause, eating at night usually leads to overeating, and can wreak havoc on your weight-loss diet. What better way to take away the stress than to eat these “happy” foods? Although we generally feel guilty after eating these foods the overwhelming desire to take the pain away out weighs our guilty conscience. Portion sizes — waiting to eat could lead to consuming larger portion sizes. Quality of food — after a long day of work or school, a few slices of pizza or a fast burger may seem easier than steamed vegetables and broiled fish. “Mindless snacking” — evenings spent studying, going out, or watching TV may lead to excess calories from fast, sugary, on-the-go options. Health concerns — consistent periods of going without food followed by a large meal can negatively impact the interaction between blood sugar and insulin and make you more vulnerable to Type 2 diabetes. However, limiting late-night meals and snacks may be an effective weight management strategy for some because it helps them to control their overall calorie intake. Some people find that if they set a time that they can’t eat past, it helps minimize or eliminate the possibility of munching on a lot of high calorie foods. Another useful tip may to be to eat four or five smaller meals and snacks spread evenly throughout the day so you don’t become overly hungry at any point. Following these tips can keep your energy levels consistent for work and play and can provide some long-term benefits to help you reduce your chances for diabetes or other health issues. Try not to eat late in the day or after dinner, unless your schedule just won’t allow it. Eat 4-5 times a day. Prepare your meals the day before, in the morning, have your spouse prepare if you are to busy.Distract yourself — take the dog for a walk, curl up with a good book, or relax in a hot bath. Satisfy your cravings with a low calorie health snacks. Increase the fiber in your diet, especially at dinner. Try adding beans or whole grains to keep you feeling full. Women should get 25 grams/day and men 38 grams/day. Increase the protein in your dinner. Recent research suggests that protein has the greatest staying power to keep hunger at bay. Limit all eating to the kitchen or dining room, and always eat while sitting down at the table. Don’t eat in front of the TV, causes more munching. Eat slowly and enjoy the taste of your food. Give yourself 15 to 20 minutes for your brain to get the signal that you have had enough. Start your day with breakfast. People who skip breakfast are more likely to snack impulsively on calorie-laden foods. Use your diet journal like MyFitnesspal to help you track your meals and keep you on target with your eating plan. Drink plenty of water. Not only will it help you stay hydrated, it will give you something to do with your hands and mouth. Trina Potts is an Atlanta based Certified Personal Trainer, the owner and operator of Giddy Up Personal Training. 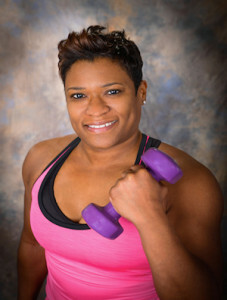 Trina was drawn to the fitness industry in an effort to fulfill her dream of helping people make fitness a lifestyle. After discovering that the majority of gyms and studios focused on men and bodybuilding, Trina became determined to provide a fitness facility that addresses the diverse needs of busy women who are forced to juggle multiple competing priorities daily. After much research and dialogue, she decided to open Giddy Up Personal Training in an effort to create a studio that embodies the environment these women wanted: to be more comfortable, feel safe and motivated to work out. Trina takes a holistic approach with her clients, ensuring that they have “real” mind and body solutions that fit into their busy lives. With her Giddy Up3 concept approach, she specializes in weight loss, muscle building, toning, strength training, core strength, balance and flexibility, cardiovascular health, high intensity interval training (HIIT) and nutrition coaching. Trina has had tremendous success helping others improve their lives and achieve more than they thought possible.